GHANIM International Corporation continues to promote bruneihalalfoods products to the globa l market by participating in international expos. The organisation attended Gulfood, one of the world’s largest annual food and beverage trade exhibition held recently in Dubai, UAE . This is part of Ghanim’s initiative to expand bruneihalalfoods market reach to the UAE market and the Middle East market in 2017. 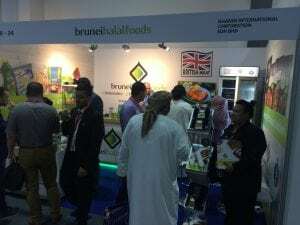 At Gulfood, bruneihalalfoods showcased both the local and international products including Blue Shrimp Crackers and Cordial syrup manufactured in Brunei as well as Frozen Breaded and Marinated Chicken Range and Flavored Lamb Sausages and Burgers Range manufactured in Ghanim’s facility in the United Kingdom. During Gulfood, bruneihalalfoods received several recognitions including winning the Gulfood Award 2017 for ‘Best Artisan or Local Food’. 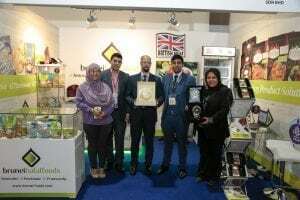 According to a press release, bruneihalalfoods was also granted the UAE Halal National Mark from the Emirates Authority for Standardization and Metrology, ESMA, providing Ghanim the endorsement to market its products in the UAE. “The Middle East is an important market for Ghanim as part of its aspiration to serve the emerging Muslim market and participating in Gulfood is opening immense opportunity for us to expand into the Middle East through the UAE. We are honoured and excited to be recognised with both the award and recognition. One of the products is the Blue Shrimp Crackers. This gives us the confidence that bruneihalalfoods products, particularly made in Brunei products, are competitive in the global market. The Blue Shrimp Crackers is a product out of a partnership with Marimin Sdn Bhd. We hope that this recognition would spur more interest from the SMEs to collaborate with Ghanim to develop local products that can be exported globally”, Dr Nur Rahman, CEO, Ghanim International Corporation.